Nokia has announced that ESPN Radio is coming to the Windows Phone Nokia Collection. 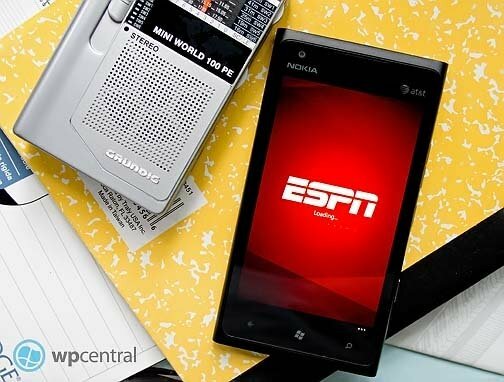 The Nokia ESPN Radio app will bring over thirty five ESPN Radio podcasts and all ESPN Radio stations to your Lumia Windows Phone. In addition to the podcasts you will be able to listen to every game of the World Series, College Bowl Games, the BCS Championship game, US Open Golf and every college football game that ESPN Radio broadcasts (War Eagle!). Each station you tune into you can view the programming and the Twitter feed. You can also tag stations as favorites for easy access. The Nokia ESPN Radio app is an exclusive for the Lumia line of Windows Phone and should be live shortly (Nokia is reporting 1-2 days). You will be able to find the ESPN Radio app in the Nokia Collection in your Windows Phone Marketplace app. Once we get our hands on the app, we'll share our first hands impressions and update things with the Marketplace links. Source: Conversations by Nokia; Thanks, Ken, for the tip!